Are you aware the licencing body of the pest control industry in Western Australia – the Health Department of WA – when issuing licences to commence a pest control business, doesn’t require licensees to have any insurance nor does it require them to get police clearances??!! This lax attitude from the department simply encourages poor practices and can cause serious issues for homeowners and businesses alike. We have campaigned for change to make the industry safer for all concerned however so far this request has fallen on deaf ears. Like to change? Email the department: pesticidesafety@health.wa.gov.au. Perth Pest Control is proud to announce they have committed an annual percentage of every pest control service conducted, total company turnover and planned special events for Telethon. Perth Pest Control is operated by the Moyle family and having many siblings, the directors of the company appreciate the services Princess Margaret Hospital has to offer and the benefit to the community it brings and as such, wish to give back to the community and do so as a long term commitment. Perth Pest Control is one of the first companies in Australia to be Accredited to offer the new FMC Million Dollar manufacturers termite damage warranty. 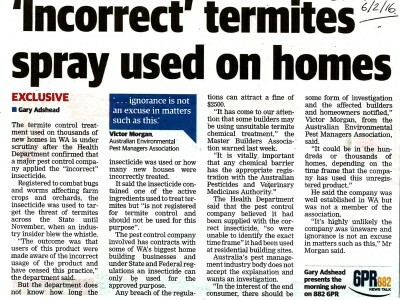 Channel 7 ‘Today Tonight’ program reports that up to 70% of Australia’s pest Control Industry may not be fully insured. Perth Pest Control’s pre-construction division to support the Association for the Blind of WA. 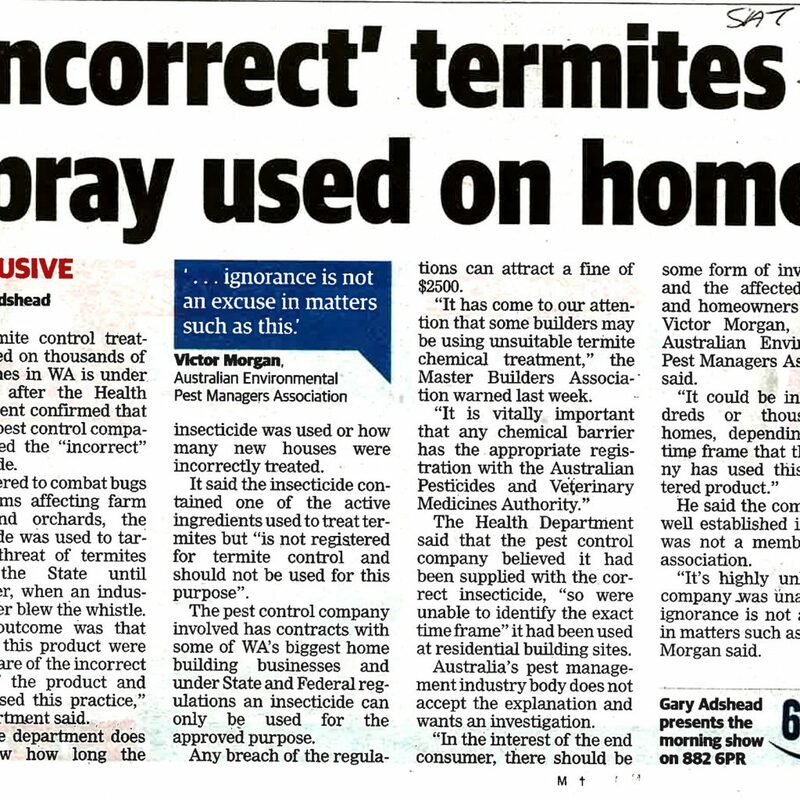 Perth Pest Control launch new industry leading termite protection package, offering affordable, effective protection and superior warranties.